This month my site traffic stayed very similar to last month, which was a bit of a surprise because I only blogged twice this month and I didn't do much to promote those posts. However, I did redesign my website and send an email to my list about it, which resulted in 1500 clicks from the email to my site in just one evening. It's amazing how much excitement and traffic a new design can stir up! Most popular opt-ins: My social media action plan. Who knew this little content upgrade but generate so much attention?? It's had almost 1000 subscribers! This month, I decided to delete 600 'cold subscriber's. Mailchimp calls them inactive subscribers and Convertkit (which I use and love!) calls them cold subscribers. Cold subscribers are people who don't open your emails. You're essentially paying to leave them on your list, which is silly, right? I sent an email to all my cold subscribers asking them to click a certain link if they wanted to remain on my list. If they didn't click within 7 days, I told them I'd delete them. I sent the email to about 800 subscribers and around 200 clicked to say they wanted to stay on my list. I deleted the others. I deleted them because I want an email list of people who are genuinely interested in what I'm saying. Engaged email lists are 10x better than lists that are simply large. If you use Convertkit and you want to find out how many cold subscribers you have, just create a new broadcast and select 'cold subscriber's as the filter. Social Splash went up to $29 from $24 on the 1st of March but I still get sales- yippee! Part of me was thinking no one would buy it when it went to full price. There isn't a big price difference so I don't know what one earth I was worrying about. I sold 15 copies full price this month and made £253 without any sales funnels in place and barely any promotion. It was completely passive income. It feels SO good to have gotten the hard work out the way. Now, I can enjoy the truly passive part for a while. This month, I've been redesigning my website. I've always known this as a designer but it really hit me hard this week. I'm such a perfectionist with my own work, and it really holds me back from finishing things. I decided to just get my design looking good, then publish the changes. I can always improve it later. I've had a few well-meaning blog readers email in and point out things that need improving, but I'm aware of the things that still need altering and I'll get around to them as soon as I can. I'm in the process of hiring an assistant, so once I do (hallelujah!! I get my time back!) I can handle more updates to my website while she handles tasks that have been taking a lot of my time up, like email management and social media. 1. Host another webinar. I hosted two webinars in February and had a break from webinars in April. It has been amazing to not have to talk on live video. If I'm being totally honest, I'm a very inward, introverted person, so hosting lots of webinars is not my thing. It tires me out. But now that I've had a break, I'm ready to jump back into the world of webinars! 2. Finish redesigning my website. By the end of April, I want to have completed my website. I've spaced tasks out every week of the month so that the site will be complete by the 30th. If you see anything that needs improving, I'd love it if you'd let me know! 3. Go on holiday for a week. Those two business goals are big enough to fill up my month, so this goal is something a little different. My goal is to go away and not use my phone or check in on my business. I've worked hard to create a business that can run without me, so I should utilize that. 4. Hire a VA. This sounds really easy but it's more work than you realize. When I hire someone, I have to train them to do things I'm used to doing myself and we both have to get used to working as a team. It's a scary new adventure, but one that my business is ready for! 5. Finish creating my new FREE course: Find More Clients. I'm taking the audio interviews from Social Splash and turning them into a free 5-day audio course. It will be released soon so sign up here if you want it! It includes audio interviews with Maya Elious, Heather Crabtree, Kayla Hollatz, Rekita Nicole and Alisha Nicole. Creative Compass: My friend Erin E Flynn has just launched the most PRACTICAL course I've ever taken: Creative Compass. It teaches web designers and developers how to design a business around their life, and not live their life around their business. 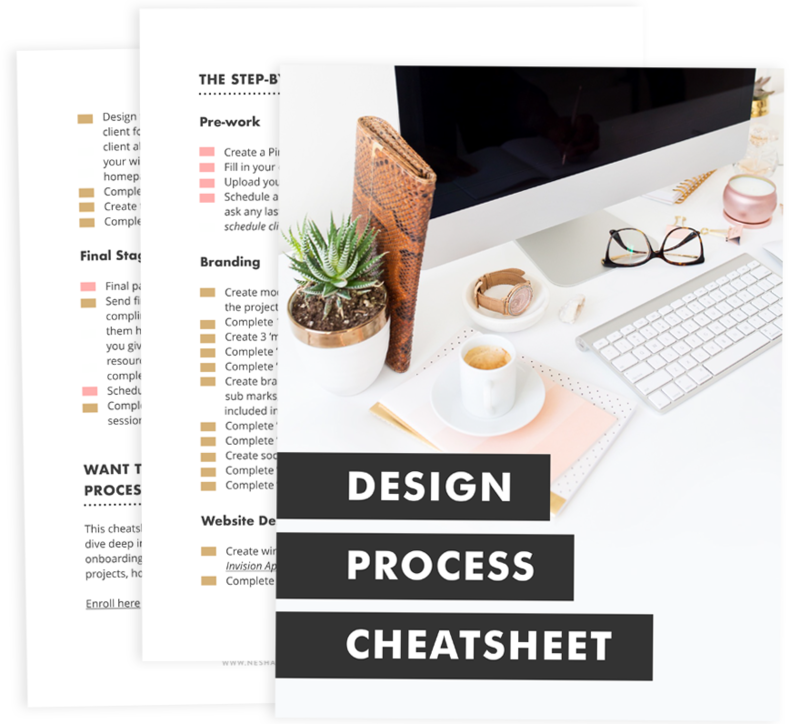 It covers everything from designing your work week, defining who your ideal client are, creating a business plan and more. If you want a stress-free business that allows you to enjoy your time, family and LIFE, Creative Compass sure will get you there. Harpoon: I've been on the hunt for new invoicing software to replace Pancake, and when I found Harpoon* I was REALLY intrigued. Harpoon is invoicing and accounting software with a twist- it also a feature to allow you to set financial goals. Then you can track your goal within Harpoon. Seriously, the concept is amazing. If you love financial planning like me, check it out! This will be game-changing for freelancers. Convertkit: I joined Convertkit* months ago now, but it was only since listening to the founder, Nathan Barry, being interviewed on Being Boss that I realized how many features I wasn't using. I'm now going to start working on tagging and segmenting my list better so that my subscribers will only be sent what they're interested in. The Teachable Blog: I often forget that software companies have blogs because they're kinda hidden in the footer of their site. But I'm really into Teachable's blog right now- they showcase a variety of entrepreneurs every week! It's a great way to find new people to follow and learn from. Pinfinite Growth: This course* has always been a bit of an obsession for me ;) but if you haven't taken it yet then I wanted to let you know that Melyssa, the creator, is giving all participants $1000 of bonuses if you join before March 31st 2016. If this is a course you've been thinking of taking, get it now! It's so worth it.